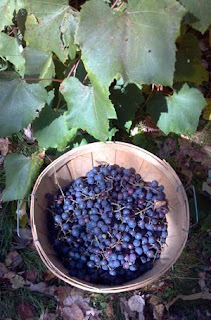 Monday was grape harvest day and the pickings were good. There were a lot of clusters that didn't ripen; they seemed to be stricken with something and shriveled up. But there were still plenty to pick, despite all the rain and crazy weather over the past few weeks. Before the day is out, these little grapes will be jelly. Really. Daisy in 2001, shortly after she moved in (and took over). Can't you just see that old soul in those eyes? I Saw Something Fine - Or What Is It About This Guy?